This month, The Chocolate House in Dupont Circle, DC, had a chocolate tasting for River-Sea Chocolates, a bean-to-bar chocolate company based out of Sterling, VA. Time Cupsoul was excited to discover another local chocolate-maker, especially after the realization that Undone Chocolates has quietly slipped from the local chocolate radar screen. Who knows about that? One loss, but another big gain for the DMV region with River-Sea Chocolates. The two makers at River-Sea, Krissee and Mariano, a family team, were incredibly welcoming during the chocolate tasting, standing behind a table display in the back room of The Chocolate House, smiling. Their display table was strewn with various chocolate bars, a pitcher of cacao juice, and numerous sloth stuffed animals wearing River-Sea Chocolates shirts. So Cute! The River-Sea Chocolates bar that immediately drew our attention, however, was the 70% Dark Chocolate Social Impact Peruvian Beans Bar. The makers explained that this bar was part of a program supporting producer livelihoods otherwise affected by political corruption or war in the region. The specific origin listed on the chocolate bar is “Peru – the Urayali River.” On the back of the packaging, it also states, “Your purchase supports educational programs for Litter Clean-Up and prevention in the Amazon River Basin.” The packaging also totes the River-Sea logo, which we personally interpret to be a cacao pod artistically rendered into an international globe or larger metaphor for waves and the sand and ying and yang energy. A picture of what is assumed to be a local Peruvian village also adorns the front of the paper packaging, and lists “Notes of mocha, cedar and berries.” Yum. 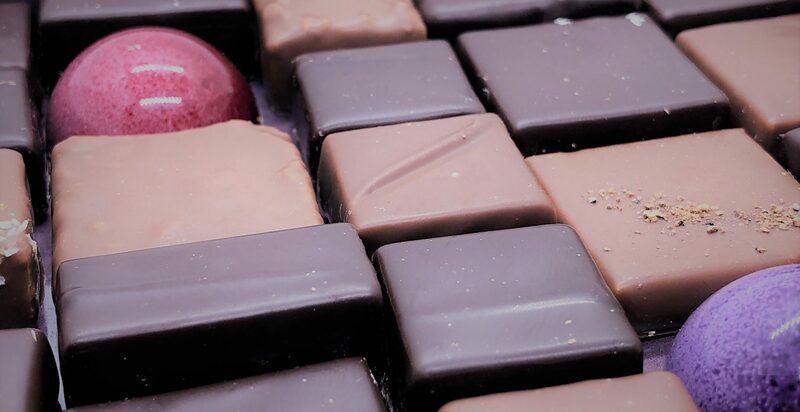 At the tasting, Time Cupsoul took a nibble of the cut-up chocolate pieces, so unwrapping this bar upon returning home, and seeing the pretty bar molding, or the River-Sea logo moving across the deep dark chocolate color, was impressionable. This Dark 70% was our favorite of all of the bars at the tasting, but please understand, all of the River-Sea Chocolate bars tasted good. We just have a darker-learning palate. The snap of this bar is solid. The bars’ thickness heirs on the thin-medium side, which we like. Of note, however, is this bars’ uncanny fortitude against melting. This week showcased record-breaking high temperatures in DC, and somehow, the bar didn’t melt into oblivion. Could it have to do with the ingredients, perhaps? Time Cupsoul looked. Cacao beans (Peru), organic cane sugar (Brazil), and organic cacao butter (Tanzania). Also, the cacao juice was absolutely delicious. This was the very first time since we tasted the delicious pulp from a glass urn with a spigot rather than the cacao pod itself. Drinking the fleshy pulp direct from the cacao pod, sorry, there is just nothing else like it in the world. Cacao pulp is sweet and tangy and incredibly refreshing. Would Time Cupsoul buy River-Sea Chocolates again? It could be meeting the local makers at The Chocolate House (support local vendors! ), the packaging with origin photos that connect the patrons to the global story/producers, the sustainability message, or just the fact that the chocolate is decadent. It’s probably a combination of all of the above. There’s a special rawness to this small bean-to-bar brand that you simply don’t want to miss. *Please note that this chocolate bar, as consumed and reviewed by Time Cupsoul, was randomly chosen and purchased with personal funds. This bar is approximately $10 and can be purchased at The Chocolate House in DC. We love River Sea! So glad you got to enjoy it! Fantastic flavors…I’ll definitely get more! Fantastic flavor…River Sea does a wonderful job! I love this chocolate! It’s delicious!